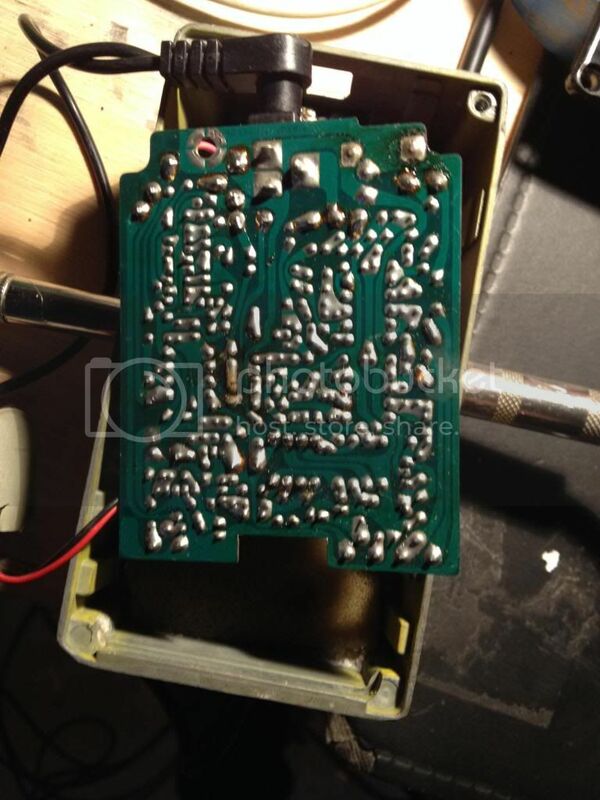 So this is my first venture into bring a commercial pedal back to life. Not super familiar with flanger circuits. As it stands right now, it won't pass a signal when the pedal is on or off. The LED does come on though. I see a bunch of solder bridges on the board but i'm not sure if someone tried to fix this before it landed in my hands. I also see some black looking corrosion on a few of the IC's, is that a good indication that they're toasted? Where's a good place to start? First impression shows no excessive tampering on the soldering. However, a really sharp photo would help. The 2 electrolit capacitors (C130~2, 47uF in series) for the LFO need to be replaced, based on the color change in your photo, as well as that they virtually always need to be replaced. It's the caps on the "orange" looking trace on the mid-left side of your photo. I suspect the caps are orange as well. Find C135 (47uF, 6.3 volts) and replace it. That may be your first step towards flanging. Sorry to dig up a thread but I got here by searching for "corrosion". Lo and behold my FL-9 is corroded in exactly the same place. I already tried to re-solder the joints since the capacitors didn't look bulged but my soldering iron wouldn't melt through the solder. Do I just need to clean it off? Alcohol and an old toothbrush? The cause of the corrosion is leakage from those caps (as I write earlier in this thread, they always leak). This means that, while thy look not bulged (who cares) they are spitting out electrolit which reacts with the solder to something poor solderable. Use plenty of solder and plenty of flux to gradually remove the solder of all affected joints with solder wick. Use a small surgical knife to scrape away all blackening from the affected traces and, when clean, tin em with solder. Only when all is completely clean (all will solder easily again) start off to replace with new components. When a component is "affected" even in a minor way consider it defective. If not now it will become so in time. Resoldering "may" in some locations be a temporary fix but will never be long-term. Dirk_Hendrik wrote: Use plenty of solder and plenty of flux to gradually remove the solder of all affected joints with solder wick. Use a small surgical knife to scrape away all blackening from the affected traces and, when clean, tin em with solder. Only when all is completely clean (all will solder easily again) start off to replace with new components. When a component is "affected" even in a minor way consider it defective. If not now it will become so in time. Dirk_Hendrik wrote: Resoldering "may" in some locations be a temporary fix but will never be long-term. Yes, but it's so easy to resolder every joint that looks bad (well, until I didn't manage to melt the corroded stuff!) that it's always a good first step to try, and to replace the faulty parts the solder needs to be melted/removed anyway. Thanks for your help, I may bug you again with more qns since you seem to have fixed a few! Sure, as long as you keep it in threads so others benefit as well.